— “The animals have been cut with a “sharp object. - Andy Collin, Detective Sergeant, Croydon, U. K. Police Dept. 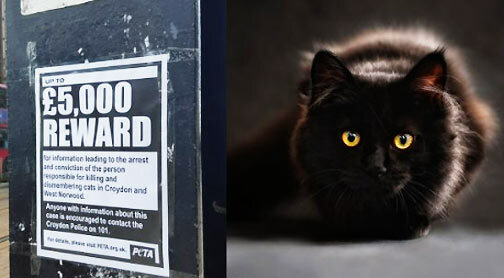 March 6, 2016 London Borough of Croydon region 12 miles south of London, England - There have been some fifty bloodless cat, fox and rabbit mutilations between January 2014 to January 2016, centered around the Borough of Croydon in the county of Surrey a little south of London. Since the end of December 2015, PETA in England has increased a reward for information to convict “cat killers” up to £5,000 ($7,116). The South Norwood Animal Rights and Liberty (SNARL) group near Croydon is appealing for anyone with information or concerns about cat mutilations to contact them: SNARL 07957-830490 or 07961-030064.